We love someone who knows how to laugh. We love someone who can laugh at themselves and especially a couple who can laugh with one another. Jacqueline and Hunter are those people. We laughed it seems like throughout the whole session, and yet we still were able to capture some really sweet moments with them. Luke & I absolutely loved our time with them and are definitely looking forward to their wedding in 2017. We met up with them at the Hermitage Gardens in Norfolk Va. I am honestly amazed that we have not had more sessions there. It is GORGEOUS! Despite the clouds and the chilliness, there was still so much beauty around us. The house is amazing and such a gorgeous backdrop! And then the gardens themselves in December still looked so pretty! We will definitely have to come back in the spring and summer and check it out. For the first part of their session they brought their dog buddy along. And if you follow our blog or Instagram you know we love when our couples bring their fur babies! Buddy was such a good boy and even crosses his paws when he gets his picture taken! It was so adorable! He definitely stole the show for a few pictures! He is so photogenic! Thank-you Hunter & Jacqueline! You two are so awesome and down to earth! We have loved our time with you and cannot wait to celebrate with you next year at the Norfolk Yacht Club! 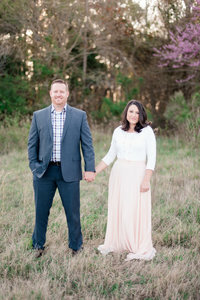 Here our some of our favorites from their Engagement Session! Best reaction EVER! We look forward to doing this fun exercise with all our couples! Look at Buddy! What a gentleman! LOVE this one so much!!! Love this sweet picture! They love to laugh… but we got some sweet ones too!